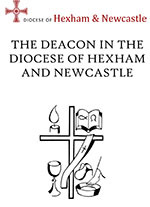 Is God calling you to be a Deacon in the Diocese of Hexham and Newcastle? 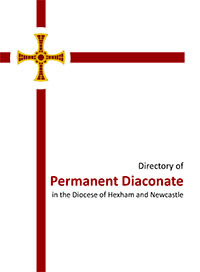 The Directory for the Formation of Permanent Deacons in the Diocese of Hexham and Newcastle (download in pdf - word) is based on the 1998, 'Basic Norms for the Formation of Permanent Deacons' and the 'Directory for Ministry and Life of Permanent Deacons'. Re-established at the Second Vatican Council, the Permanent Diaconate now forms a rich part of the ministry of Holy Orders in the Diocese of England and Wales. The Directory provides the basic information for those enquiring about the ministry as well as establishing what and who a Deacon is for our Diocese. Deacon Martin Bell, Director of Deacons. The following information may help you decide if you have the necessary attitude and background to think seriously about this vocation. 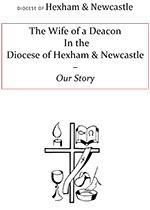 We also acknowledge the importance of your Wife, (if married), in decision making and to help her there are some individual reflections outlining the journey of a 'Wife of a Deacon' written by women in the Diocese who have experienced the transition. Although we are all called to serve each other and to a life of holiness, all men will not be suitable to commence the four years of formation leading to ordination as a deacon. The following information may help you decide if you have the necessary attitude and background to think seriously about this vocation. We would be looking for someone who has a proven track record of service in the Church. This service might include parish service such as being a reader or special minister, being involved in SVP work or other charitable activities - generally somebody with some breadth of involvement in the parish community. Your experience may be outside the parish such as chaplaincy work, Apostleship of the Sea, teaching or hospital work. We would be looking for evidence of your ability to work with others and relate to others generally in a variety of situations. Your work experience may have given you a wider perspective on the world of work and be evidence of your openness in relationships. There are no specific academic qualifications required but we would expect you to have some academic or intellectual interest. We would expect you to have some evidence of recent study at whatever level. Spirituality should be an important factor in your life and we would expect you to have a disciplined prayer life and an interest in things of the Spirit. Involvement in the sacramental life of the Church is essential and we would look for evidence of that and an affinity with the liturgical life of your parish community. Finally we would hope that you have an on-going relationship with either your own pastor or another priest who is giving you guidance and support. At the very least the pastor of the parish in which you worship should know you and support your application. If you are accepted and start training you will become part of the Diaconal Formation Community. Academic Formation is undertaken at Hinsley Hall, Leeds, together with the other Northern Diocese for Academic Study and the Diocese Formation Community for Pastoral Support and Experience. The Formation Community meets twice a term on a Saturday in St. Hilda’s Diocesan Resource Centre, Newcastle Upon Tyne. The formation of a deacon is essentially self-formation, and the aim of the preparation time is to help you discover and build on your sense of vocation and discern the areas of ministry you are most called to and gifted for. Formation is a process not a program and therefore involves a deepening commitment to the mission of the Church. If you are interested in the Permanent Diaconate you should talk to your pastor and then contact Fr. Sean Hall. The process of application involves a comprehensive application form which requests all the information usually provided in a C.V. It also asks you for personal references and professional references, where appropriate. Your pastor and dean will be contacted by the Director of Formation. Psychological assessments are mandatory for all applicants, whether for the Diaconate or the Priesthood. These assessments are confidential to you, the Bishop and the Director of Formation. On receipt of satisfactory references and assessment you will be asked to attend a diocesan interview. This panel will advise the Bishop whether you should be accepted, delayed or refused. The Bishop will interview you and make a final decision as to whether you should be accepted for formation. Your first of four years training will be a preparatory year at the end of which it will be discerned, both by yourself and the team if you will be accepted for a further three years training. In those following years you will be assessed at the end of each year, and with the Bishop’s approval continue in formation.